The film tells the story of Mother Teresa of Calcutta. She was regarded as one of the most significant personalities of the 20th Century, although she never owned more than a white and blue sari. She influenced the decisions of the most powerful men on Earth, although she always stayed close to the poorest people of the world. 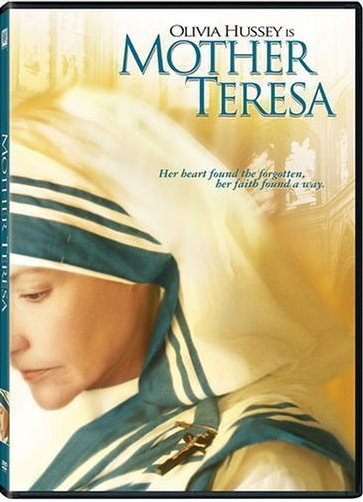 This film based on the life of Mother Teresa is one of the best faith and family films I have watched in some time. The acting is top notch with Olivia Hussey playing Mother Teresa; she is captivating in the role. The film’ s pace is excellent, the music is compelling without being overpowering, and the story is tight. Mother Teresa faces one obstacle after another in this life story and she overcomes each and every one through faith and prayer. The story begins in 1946 and she helps the poor on the streets of Calcutta. A young man lying in the street says, “I thirst.” He soon dies and she stays with him until he does. In the next scene Mother Teresa is looking at a crucifix with Christ on it and it includes the words “I thirst.” Her compassion is abundantly evident. Though initially ordered to stay at the convent, she prays and tells her leaders that Jesus wants her to go to Calcutta. This first miracle, in which she is allowed to go, is just the first of many to come. This film even includes humor. In one scene some visitors come to see what she is doing in Calcutta, and she points to the children, and says, “Look at these dangerous faces.” In another compelling scene, she asks for help from a vendor for the children. She asks, “Do you know how many children I have?” “None,” he replies, “You are a nun.” “Twenty,” she replies. “Children belong to everyone.” He promptly helps out! There are many great nuances and mini-stories within the film, but I will quote Mother Teresa: “It is in forgiving that we are forgiven. And it is in dying that we are born into eternal life.” This woman indeed died out to her own life. Her story should not be forgotten. via Mother Teresa | Find Top Family Movies | Dove Family Friendly Movie Reviews. A really great movie with great actors, inspiring music, also some rather funny scene as well as very dramatic ones and over all great story.